Vegetables are a great choice for grilling and whether cooking over an open fire, which imparts a lovely smoky flavor or on a handy indoor electric grill, the possibilities are endless. While most vegetables do very well on the grill, corn on the cob, summer squash, red, green and gold bell peppers are perennial favorites. 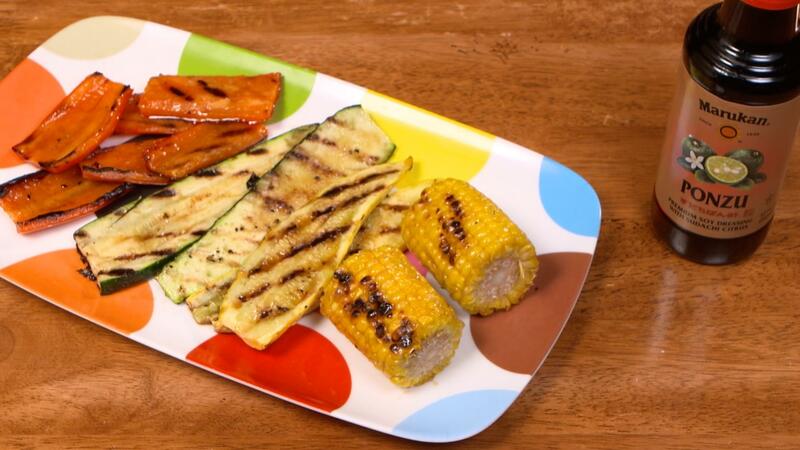 Get the Ponzu Glazed Grilled Veggies recipe here! Vegetables with high moisture content, such as leafy greens, celery and cucumbers would not be great grilling options. You should choose fresh vegetables that are still firm to the touch with bright skin without bruises or blemishes. Zucchini and yellow squash can be sliced lengthwise and bell peppers cut into large pieces. Corn on the cob divided into 4 inch pieces is easier to handle on the grill and on the plate, too. Vegetables will cook more evenly and are less likely to char or stick to the grill if they are first brushed with a little olive oil and then sprinkled with sea salt and coarse black pepper. Ponzu Glazed Grilled Veggies is a quick and easy dish that adds a layer of sophistication to the usual cookout fare. Enough for a crowd, this recipe calls for several pounds of yellow squash and zucchini, a half dozen bell peppers and eight ears of corn. The glaze is based on a premium soy ponzu dressing, made with sudachi citrus, a unique imported Japanese lime. This ponzu from Marukan Vinegars is gluten free and has a distinct, refreshing citrus flavor.